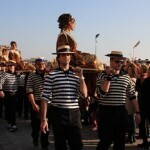 Carnevale begins with some special events commemorating the Carnevales of the past. One of them is a local favorite, the "Festa delle Marie." 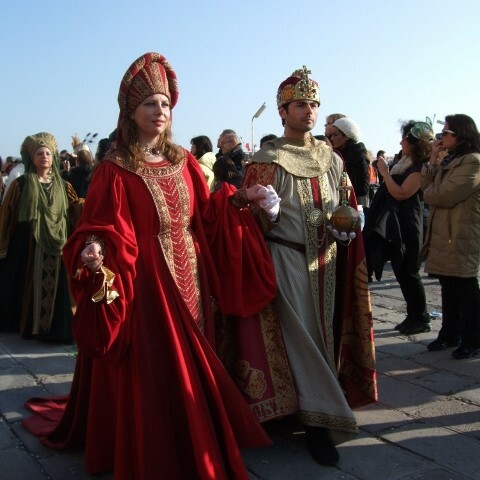 As far back as the 10th century, the city of Venice consecrated all marriages including those of 12 young humble Venetian girls, on February 2, the day of the Purification of Mary. These 12 young women were given sumptuous dresses and adorned in beautiful jewels. In 973, pirates supposedly abducted these 12 girls and their jewels. They were rescued along with their jewels. The Festa della Marie originated to commemorate this event. In those days, 12 poor local girls were selected, dressed in finery by the Venetian aristocrats, and traveled in a procession around the city from church to church. People went to the churches to admire the girls. City officials, angered by this, quickly replaced the girls with wooden effigies. In turn, the people, angry that the real girls weren’t paraded anymore, took to throwing vegetables at the wooden statues. In 1379 the whole thing was abolished. 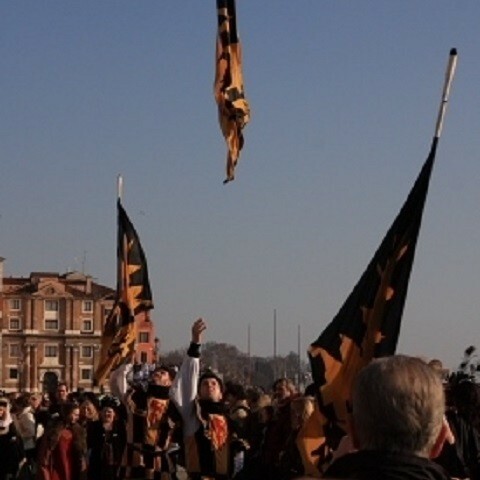 The Festa delle Marie, always held on the first day of Carnevale and is a walking parade which begins at San Pietro di Castello consisting of groups historical societies from surrounding cities all dressed in period costume, along with the twelve Marias. The Marias, dressed in beautiful gowns and jewels, are born by twelve teams of litter bearers. 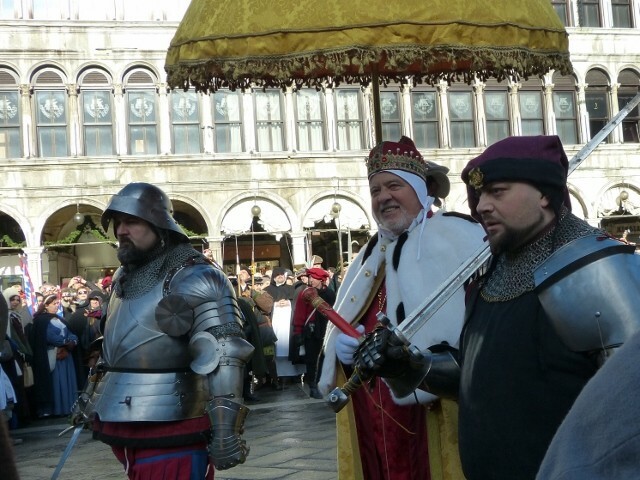 The parade proceeds up Via Garibaldi, along the Riva degli Schiavoni and ends in St. Mark’s square where the Marie’s are presented to the Doge and the awaiting public. The twelve Marias make public appearances at masked balls and public events throughout the Carnevale season. During this time votes are submitted to select the winning “Maria”. At the end of Carnevale, the winner is announced. This lucky young woman will be “the Angel” at the next year’s Flight of the Angel, where she will “fly” on a cable between the top of the Campanile in St. Mark’s square down to a stage at the opposite end of the square. The Flight of the Angel takes place on the second day of Carnevale. 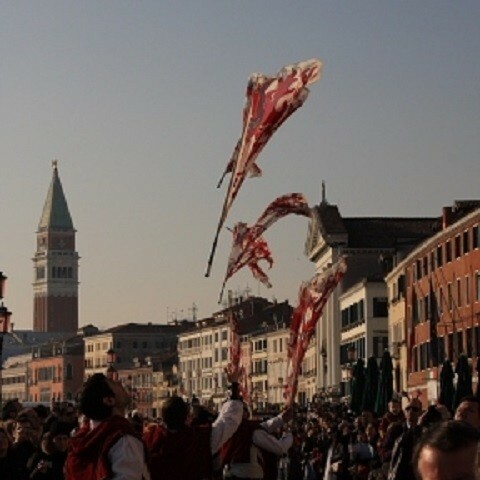 Carnevale 2014 will be held February 15 to March 4. This year’s theme is Wonder and Fantasy Nature. 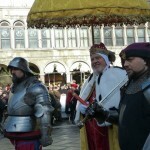 More information can be found on the Carnevale of Venice official website http://www.carnevale.venezia.it/news.php?id=5158. 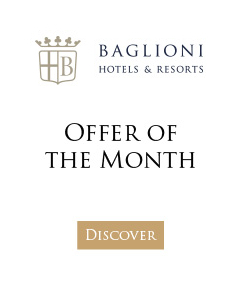 Concierge tip: Luna Hotel Baglioni has put together a special Moon Masquerade Package to make the most of Venice Carnival 2014 which includes a special surprise gift.